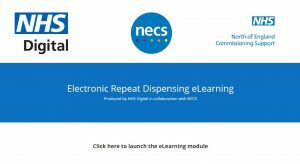 The repeat dispensing eLearning programme has been developed by North of England Commissioning Support and NHS Digital. 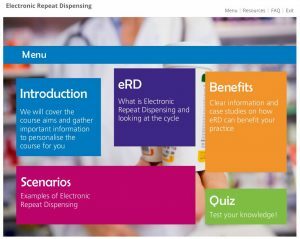 The module has been designed to promote the benefits and clear up any misconceptions around electronic repeat dispensing (eRD). It will cover key facts, explaining what eRD is – with detail about the key components. Information will be provided about how it works in the practice and in the pharmacy. You will be able to watch clinical system specific videos on how to complete the main tasks in setting up eRD for your patients.